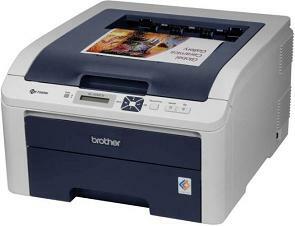 The HL-3040CN is a fast, compact printer that produces brilliant color output at up to 17ppm in both color and black. It is ideal for printing high-impact, color brochures, presentations and other important business documents, quickly and affordably. In addition, its stylish, space-saving design helps save valuable workspace and complements virtually any environment. The HL-3040CN also provides a generous paper input capacity, a built-in Ethernet interface for sharing on your network, and a Toner Save mode to reduce toner usage. Built-in Networking. Share the HL-3040CN with everyone on your network via its built-in Ethernet network interface.